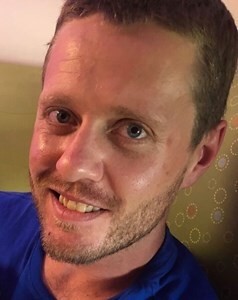 Aaron Setters, 36, died at home on Friday, April 12. Born on October 7, 1982, Aaron made Louisville his home throughout his life. He went to Jefferson County Public Schools, graduating from Eastern High School in 2001. He went on to Western Kentucky University before returning to his hometown to be close to family and friends. Aaron was the second son born to Gordon & Linda (Stoner) Setters. His older brother, Anthony was his best friend and confidant. He dearly loved being a big brother to Adam, his younger brother. The three boys enjoyed a childhood built around family adventures, Little League, and playing music. On April 30, 2017, Aaron was baptized at St. Paul Church, sharing his faith with that community. Aaron dealt with addiction and used these memories of love and connectedness in an attempt to achieve recovery. Long term recovery remained elusive but he continued to make that a goal until his life ended. Aaron is survived by both parents Gordon Setters and Linda Setters of Louisville, Kentucky, his brothers Anthony and Adam, his sister-in-law, Jennifer and his baby nephew, Keaton, who brought him such joy. Aaron’s smile, inquisitive nature and loyalty will leave a void in the lives of all who knew and loved him. Visitation will be from 4:00 pm to 8:00 pm on Wednesday, April 17, 2019 at Newcomer Cremations, Funerals & Receptions - East Louisville, (235 Juneau Drive). His Funeral Service will be at 11:00 am on Thursday, at Newcomer Cremations, Funerals & Receptions - East Louisville. Add your memories to the guest book of Aaron Setters. I hadn’t talked to Aaron in many years, but have very fond memories mostly from our time together in High School and shortly thereafter. I remember Aaron as smart, witty, and most always having a smile on his face (or a grin). We shared many laughs, sometimes at the expense of each other... Aaron and I both shared in the unique inability to stop laughing, which often landed us into trouble in classes we shared at Eastern. I will miss you my brother. We basically grew up together and I could see the Setters house from my back yard on Running Creek rd. We had so much fun together , I can remember the whole aol internet thing lol. Me Anthony and Aaron would stay up all night on that thing. Aaron has an awesome soul and had a great sense of humor. We would always joke on each other and sometimes leading to wrestling matches afterwards lol. I have a lot of memories growing up with Aaron and they have all been playing in my head since I heard of his passing. We had a lot of fun playing basketball in the driveway and loved playing baseball or hitting golf balls in the front yard. We would have bon fires down at the bottom of the driveway and the fires would be so big that the Fire Department would arrive within 15 minutes just to make sure it was under control . Then we somehow convinced our parents to let us campout down there. Lol after about 12:30 a.m. we all wanted to come sleep inside! Thanks for the memories Aaoron. I love you brother and will miss you. I will have these memories and so much more in my heart and thank you for the friendship we had in this lifetime. So sorry for your loss and I cannot begin to imagine what you are feeling or going through. I hope you find peace and comfort in this time of grief. This is a beautiful tribute, filled with love and gratitude for Aaron's life.